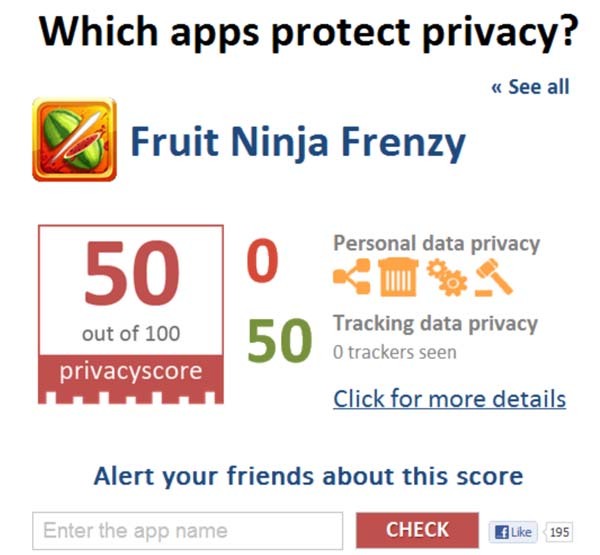 Privacyscore, a project conducted by Privacychoice, recently released a Facebook application that rates the privacy risks of the most popular Facebook applications. Pictured below is what you’ll see when you visit the app. Hovering over one of the featured apps, displays their score. According to the introductory video located on their Facebook page, a score of 90 and above is green and good. A score of 80-90 yields an orange color and cautions users to take a closer look. Anything below that shows up as red, and you’re probably better off avoiding these apps entirely. Facebook is riddled with rogue applications, and there are literally thousands of applications active on the platform at any given time. We often warn our readers to avoid silly applications and only install apps from trusted, well-known developers. This new tool will provide a great way to see which app developers should be trusted with your data. Currently, their database has information on a limited number of Facebook apps. Users can opt-in to share information with them, so that other apps can be prioritized and added in the future.